The Studio Museum in Harlem’s fifty year history has been made possible by innumerable staff, board members, supporters, artists, neighbors, and collaborators. As we celebrate their many accomplishments, we also salute the leaders who have guided the Museum to this exciting moment. Edward S. Spriggs, Director from 1969 to 1975, generously agreed to be interviewed and to share his personal perspectives and stories about his time at the helm of the Museum. His comments are edited and condensed here. How did you come to be the Director of the Studio Museum? The Studio Museum in Harlem has a very interesting beginning story. This was a very exciting thing that was going on in Harlem, this emerging museum that was being spoken of. It involved a generation of young people who were introduced to Harlem by Betty Blayton-Taylor, who was an early founder of Studio Museum. They got very interested in the idea of creating a space for young artists in Harlem to expose their work, their art. And it took off from there. Harlem had a history of wanting a museum that goes back to the 1920s, I think, and the interest in that idea was great in the community. I was very active in the community at that time. James Hinton, a photographer and filmmaker, had been in conversation with me for a number of years. We had a film company called Harlem Audio Visual, and Hinton was really the leader of that. Charles Hobson was on the Museum’s board, a real respected media person, and there were a couple other people who were really aware of all the dynamics around the struggle of black art or artists and art institutions, which were very few and far between, except on a grassroots level. So I guess between James Hinton and Charles Hobson and Betty Blayton-Taylor and Ted Gunn and one or two other people, somehow my name got into the mix. The idea was that it had to have a real connection with artists. What was your vision for the Museum? What are you most proud of? I saw the promise of what they were thinking about when they said “Studio Museum”—I mean, it’s just perfect. The idea was that it had to have a real connection with artists. I had a community of artists around me who were willing to do this. The idea of a printmaking workshop was something the art community needed. So I brought Valerie Maynard in, a very committed person and very community focused. Harlem was where she was born and where she grew up. She was a stalwart in printmaking for a long time, and very committed to sharing her work and ideas with the community. Soon we had four artists working upstairs, and the printmaking workshop. The whole dynamic of that created heavy buzz all over the community. And so we would have an exhibition, the studios would be open, and you’d go up there. You had more than just the exhibitions going on, you’re going to see artists, you’re going to meet artists. And it became a meeting place for artists. The Museum was not probably as formal as it is now but it was very accessible to the community, and that was always important to me. This was a time when there was a lot of exchange going on with different cultures and countries. And the notion was that these different cultures, living side by side in Harlem, in New York, in the Bronx, and in Queens, they didn’t really know each other, and they didn’t know each other’s art. So this was our opportunity to take a stand in terms of the institution that supported black art—we’re talking art from any country or any community that related to itself as being black. I’m most proud that we were able to give exposure to a variety of diasporic artists. It wasn’t about, you know, being a museum, or being this, that, or the other. It was about making a human connection with people who were interested in the same things that we were, but out of another culture. Harlem is an international community. And if you think in those terms it opens up a whole lot of other things that you might consider. We were in a place, we were in an international city. New York, it’s got all kinds of people living here, and Harlem’s the capital of the black world. So let’s do things that would welcome other people from other countries, other communities. I did what I could do, when I could do it, because I was given the opportunity to do it. It wasn’t easy to have a vision in the 1960s and the early 1970s because there was so much uncertainty, about sustainability and so on. But my hope is that the Studio Museum, with regard to whether it changes, or whatever it does, becomes an institution that is able to interact internationally and be a welcoming place for people of diverse communities. 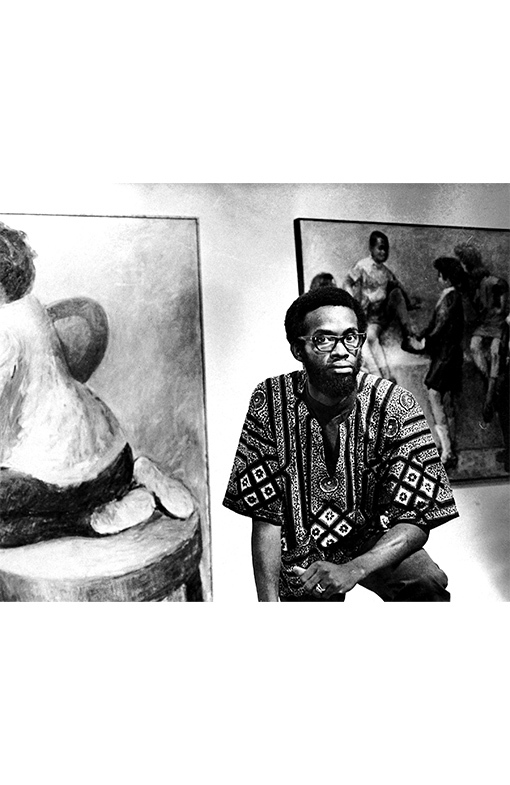 We also salute Charles Inniss (1935–1997), Director, 1969, and Courtney Callender (1937–1983), Director, 1975 to 1977.